Zoom has toll numbers available for many countries that are included with all plans. 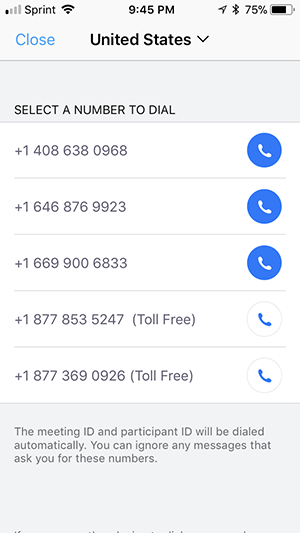 For Premium Audio subscribers, Zoom also has toll-free and additional toll numbers available. 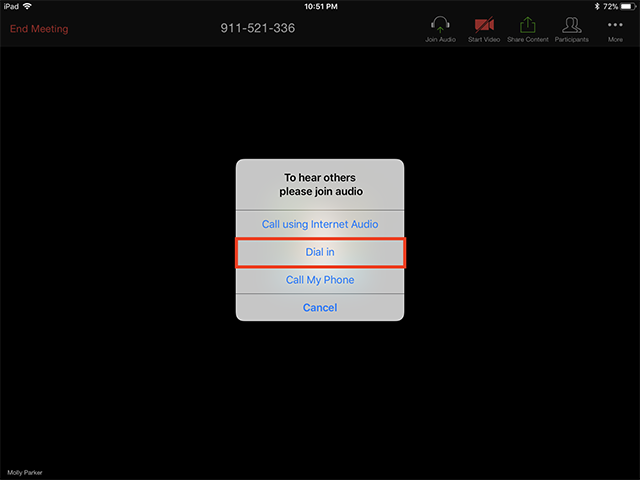 The dial-in numbers available are dependent on the host's audio subscription and settings. View list of Zoom International Dial-in Numbers. 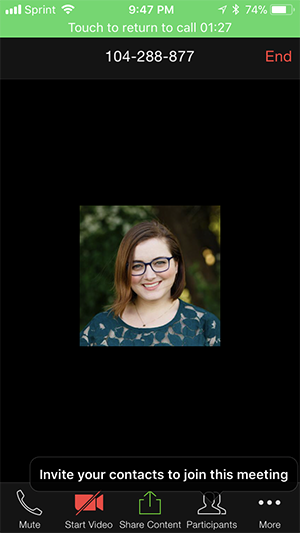 If a number is not listed or has asterisks (***) in place of some of the numbers, it means that number is not available on the account that you're currently logged into. Follow the below sections if you want to join a meeting using the desktop client for video and screen sharing, but want to join meeting audio using your phone. 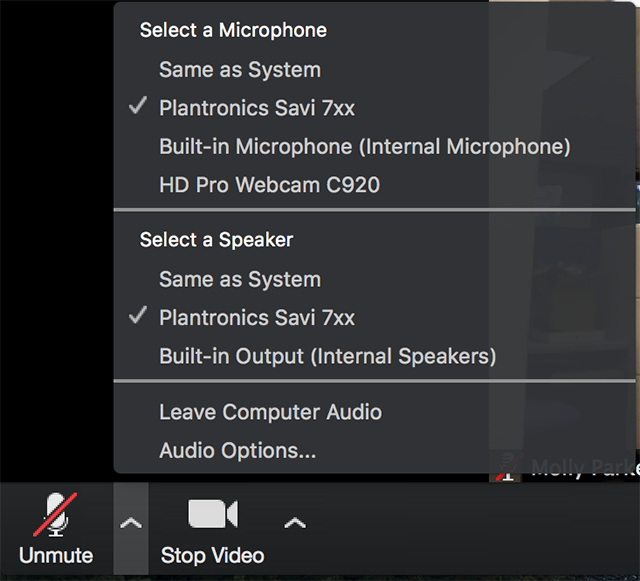 You will be prompted to join the audio automatically, but if this prompt does not appear or you close out of it, click Join Audio in the meeting controls. Note: If you are subscribed to the call out add-on, you can join the meeting by having Zoom dial your phone number. 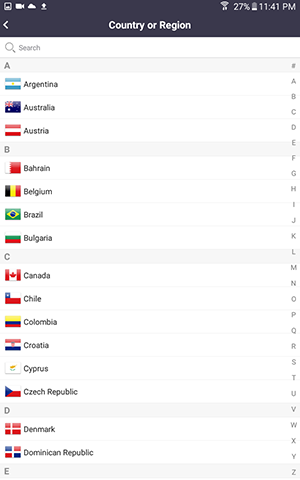 Select the country you're calling from in the flag drop-down menu. Call one of the numbers provided. Enter your meeting ID followed by #. Enter your participant ID followed by #. If you joined computer audio automatically, you can leave the computer audio and join by phone. Click the arrow next to Mute/Unmute. Click Phone Call and follow the prompt to dial in. Join a Zoom meeting in your web browser. 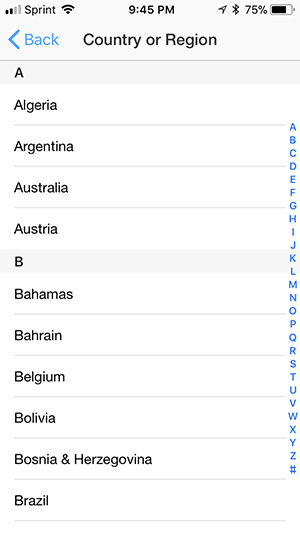 Select the country you're calling from in the drop-down menu. Dial one of the numbers provided. Enter your meeting ID, followed by #. Enter your participant ID, followed by #. Learn more about the Zoom web client. 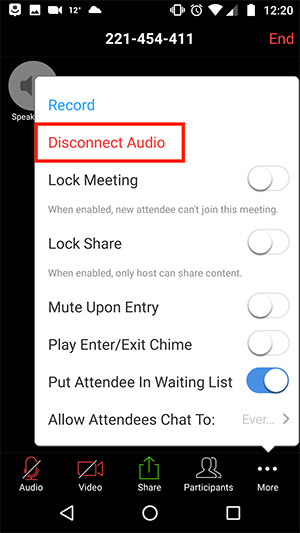 You will be prompted to join the audio automatically, but if this prompt does not appear or you close it, tap Join Audio in the meeting controls. Tap the arrow at the top to select the country you're calling from. To return to the Zoom app, swipe up on the home bar (iPhone X) or press the home button (iPhone 8 or older), then tap the Zoom icon. 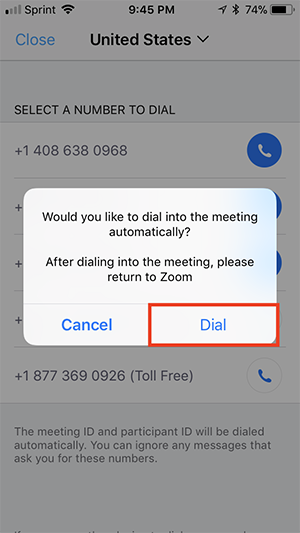 When you leave the meeting, you will have the option to Leave Meeting or Leave Meeting with Telephone Connected, to stay dialed into the meeting after leaving from the Zoom app. 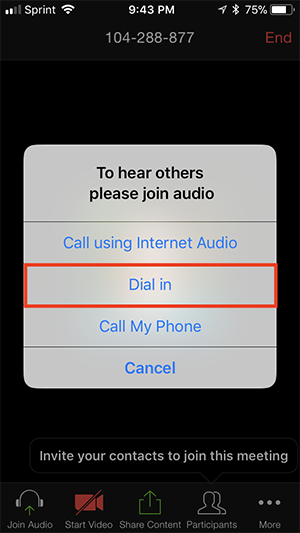 If you joined device audio automatically, you can leave the computer audio and join by phone. Tap Join Audio and follow the instructions above. Tap the arrow at the top to select the country you're calling from, if not selected by default. Tap Close after dialing in. Tap the phone icon next to the number you want to call. 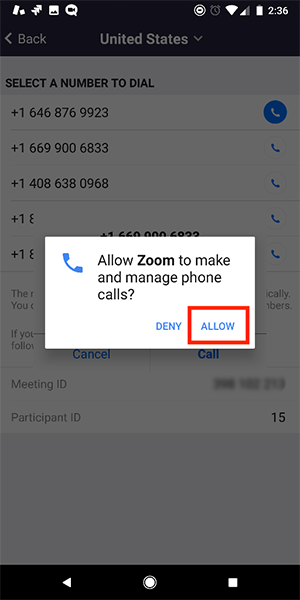 If prompted, allow Zoom to make and manage phone calls. Return to your home screen and open Zoom again. Tap Back after dialing in. Dial an in-country number. If you dial a toll number, your carrier rates will apply. 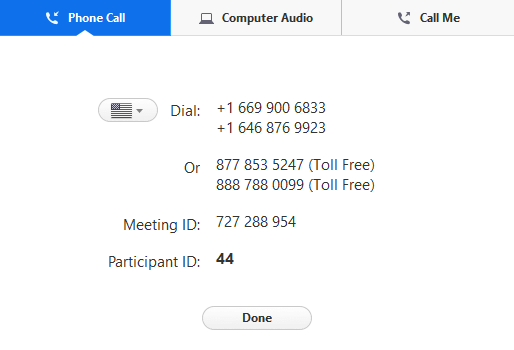 You can find the numbers on your meeting invitation or a full list of international dial-in numbers at https://zoom.us/zoomconference. You will be prompted to enter the meeting ID - the nine (9) or ten (10) digit ID provided to you by the host, followed by #. If the meeting has not already started and join before host is not enabled, you will be prompted to enter the host key to start the meeting, or to press # to wait if you are participant. You will be prompted to enter your unique participant ID. This only applies if you have joined on the computer or mobile device or are a panelist in a webinar. 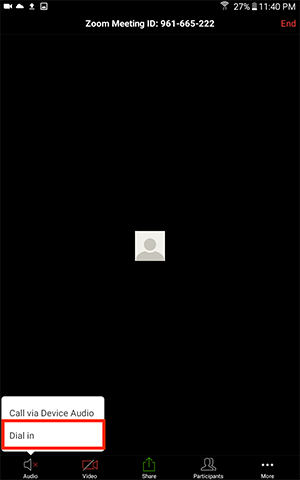 Press # to skip. 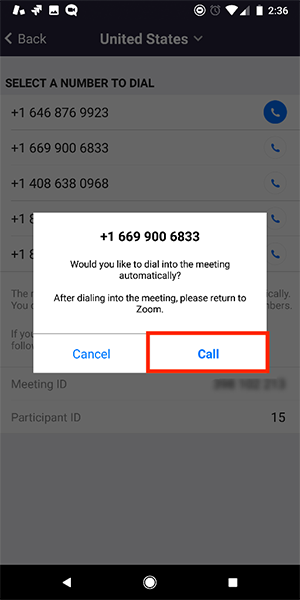 If you join by computer or mobile device later, you can enter the Participant ID to bind your phone and device session together and show your video when you speak on the phone. To enter your participant ID once you are in the meeting, enter #Participant ID# on your phone. Note: If you enable join before host and join only from your telephone, you will not be recognized as the host and will not have host controls. If you need to host meetings from your phone with full host controls, do not enable join before host. You can also consider using Personal Audio Conference. 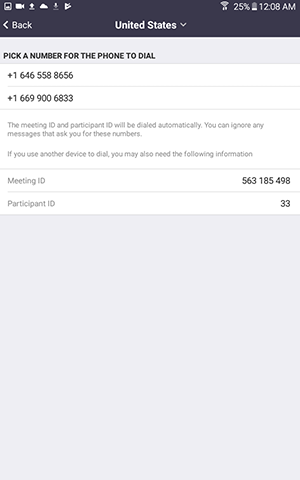 If you have scheduled the meeting from a basic account, the meeting will timeout after forty-minutes with a thirty minute warning notification, if two or more participants join or you do not bind your phone and computer/mobile device session with the participant ID. If you would like the meeting to last for unlimited duration, you will have to schedule from a Pro account. 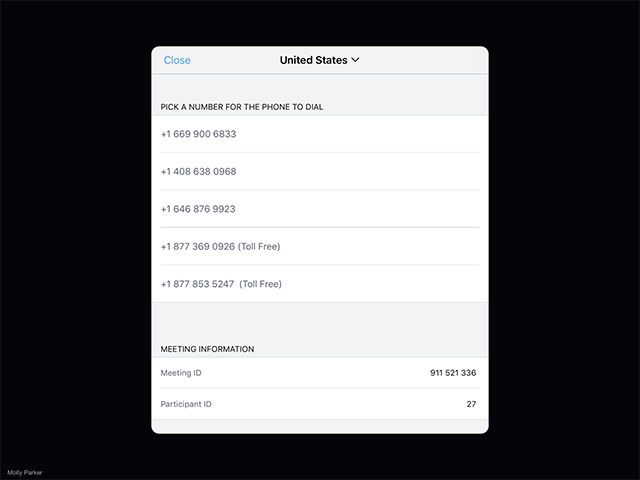 The number of phones that can connect to a Zoom meeting or webinar is determined by account type and add-on assigned to the user account. If you have entered the Host Key to start the meeting, you will have host controls available to you by entering DTMF tones on your dial pad. To hear all available commands, enter ** on your phone. Note: all participants in the meeting will be notified when recording is stopped or started.